The hamlet of Hulcote is a small collection of houses and farms spread over quite a large area with no real centre. 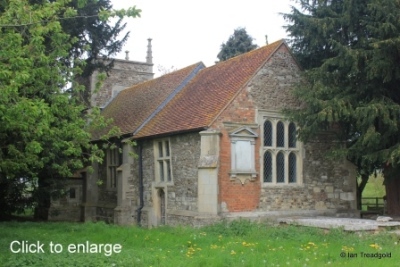 The church of St Nicholas is roughly in the middle of the area known as Hulcote but is situated across open grassland away from the road. It is to the north of the road running between the new A421/M1 junction to Salford. Parking is difficult on what is quite a busy and narrow road but there is a small verge area from which a footpath leads to the church. 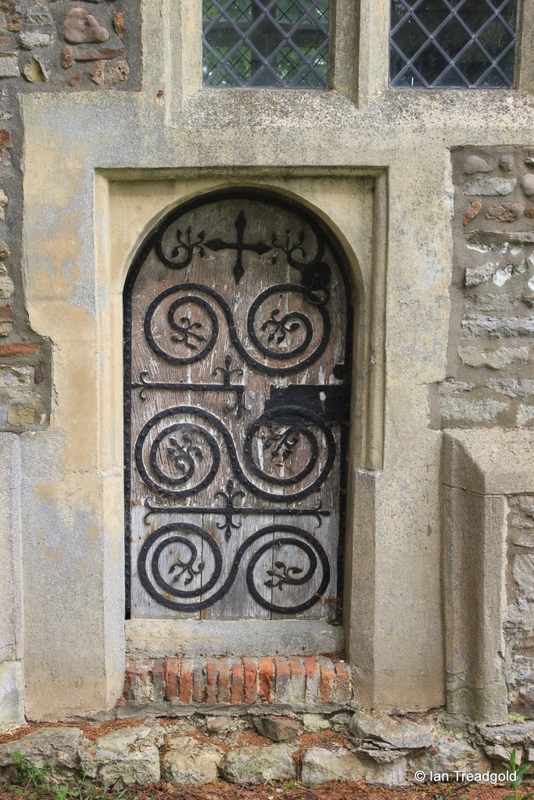 The church of St Nicholas was built around 1590 and unusually is unchanged in basic structure since that time. 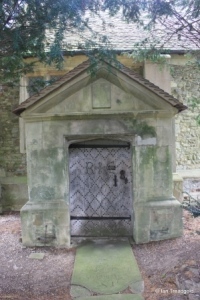 There have been repairs and restorations as necessary but the overall arrangement is unchanged since the time of Elizabeth I. 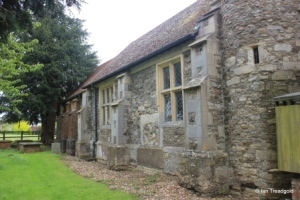 The trees in the churchyard intrude on the building making a full view difficult. The church consists simply of a nave, chancel, west tower and south porch. 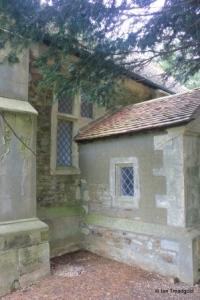 The chancel is about 18 feet by 16 with the nave being the same width and adding 29 feet to the length. The tower is about 9 feet square and some 30 feet in height. The chancel has a single window on the south side almost directly above the priest’s door. Priest’s must have been considerably shorter in C16! 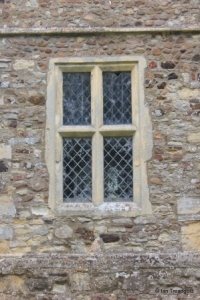 Like all windows in the church this window is divided by a transom under a square head. 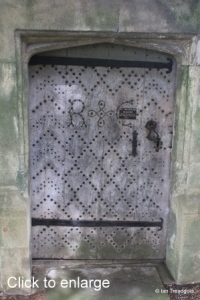 The door below has a round-head under a square opening and is decorated with ornate scrolled ironwork. 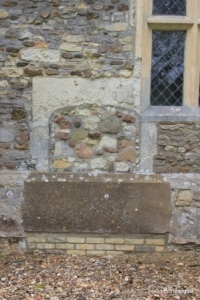 The window on the south side of the chancel is of three lights again with a transom under a square head. 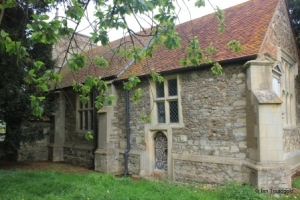 The south porch has been rebuilt at some point after 1813 and has single square head glazed windows on the east and west sides. 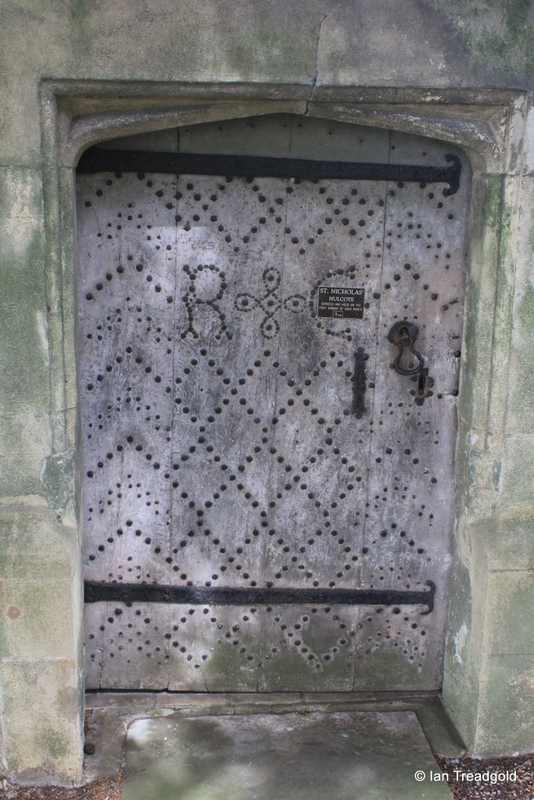 The substantial outer door is studded with nail in a diamond pattern and also outlining the initials R C.
These refer to Richard Charnock, Lord of the Manor of Hulcote and builder of the church. 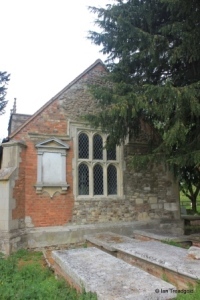 It can be assumed that when the porch was rebuilt, it was built in a larger form to its predecessor as it now encroaches on the western window of the south side of the nave, obliterating one of the four panes in this transomed two-light window. The tower is of three stages with angle buttresses and pinnacles on the roof. 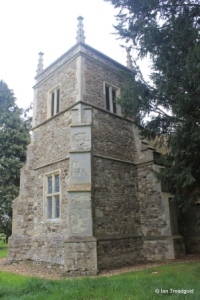 The original top of the tower consisted of a small ‘snuffer’ or multi-faceted prism shaped spire. This was removed in restorations in 1867 at which time the pinnacles were raised in height. 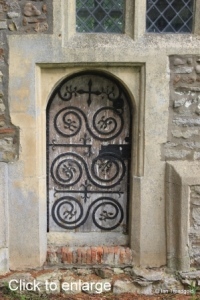 The belfry openings are simple two light square headed openings. 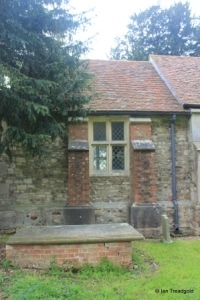 The west window is a simple two-light window in the same style as the others in the church. 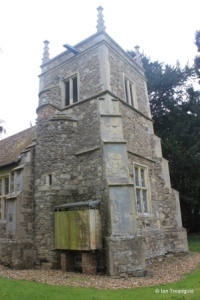 The tower has a circular stair turret on the north-east corner rising to the belfry level. The north side of the church has a similar layout of windows to the south. From the west there is a two-light window, a three-light window and, in the chancel, a two-light window to match that on the south side. 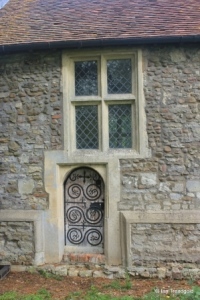 The north doorway is comprehensively blocked up although, like the south door and porch it encroached on the window to its west. The north side of the chancel has relatively modern buttress work surrounding the two-light window. The east window is of three lights with a transom, each of the size panes having a rounded head. 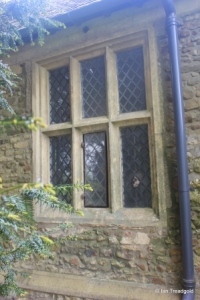 The whole window is under a square head with the hood mould extending to the sides. Adjoining the window is a C19 wall tablet now sadly illegible. Page last changed 09/05/2015. Reformatted 26/02/2016.